ELC graphic panels are simple to program and easily connect to ELC products. 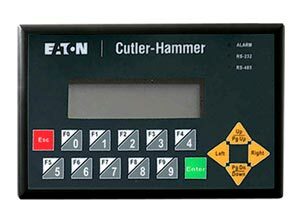 ELC graphic panels make modifying an application quick and easy, connecting to a variety of devices such as Cutler-Hammer® MVX drives, IQ MODBUS meters and others. With over 30 objects that can be placed anywhere on the display, these tough panels also communicate to other major controllers through 2 serial ports which can be used simultaneously. Transfer applications to or from these graphic panels using the handy transfer module. Ten programmable function keys allow the user to view easy-to-change pages, input numeric values, enter alpha-numeric passwords, set, reset, create alarms, password protect, import bitmaps and use many different fonts. With the ELC’s two communications ports, it can handle any networking task. In remote mode, the ELC communicates and shares information with up to 16 other devices and in normal mode the ELC can communicate with up to 32 other devices. Its small size allows for reduced panel dimensions and saves valuable machine space. The ELCSoft GP programming software allows you to configure the ELC graphic panels on a PC, then transfer the program to the graphic panel. With ELCSoftGP, applications can be created, edited, downloaded, uploaded, and much more. The ELCSoft GP software also allows the user to move programs from 1 controller to another with ease. The software is compatible with Windows 98/ME/2000/XP operating systems.